Take a minute to visit this site where Keith "Kez" Wilson presents his makeovers of cover art from Kenneth Robeson's Doc Savage series. Each one is a piece of art in the style of the original covers by James Bama, placing the "Man of Bronze" in adventures with other famous characters and creatures from genre films, as in the one pictured here with the Martian invaders from the 1950s War of the Worlds film. There's a whole bunch of them to look at, even ones featuring Dracula (Lugosi) and the Doctor (Baker). Fun stuff. Now, those books would be AWESOME to read! Any chance he can get the rights from Robeson's Estate??? That WOULD be super-cool. I wonder if rights to something like that would be especially hard to get. Sometimes rights to do adaptations or derivatives of old out-of-print stuff can be had surprisingly cheaply. I think I read somewhere that someone bought a film option on an old Olaf Stapledon novel for only like a few hundred dollars. 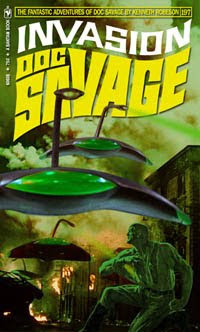 I wonder if there is an estate that would be interested in licensing new Doc Savage books...hmm. Ok did some more research on it, and it's murkier and more complex than I thought. Turns out Robeson is not a real person but a house name for the publisher (which sounds familiar now that I think about it). It's unclear to me, however, who has rights for things like novels.